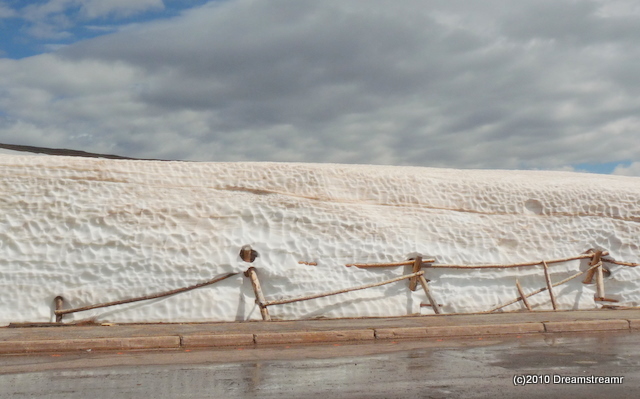 Snow still on the ground June 9! Debbie and I each, separately at different times, lived in Estes Park apartments in Chapel Hill in the ’70s. 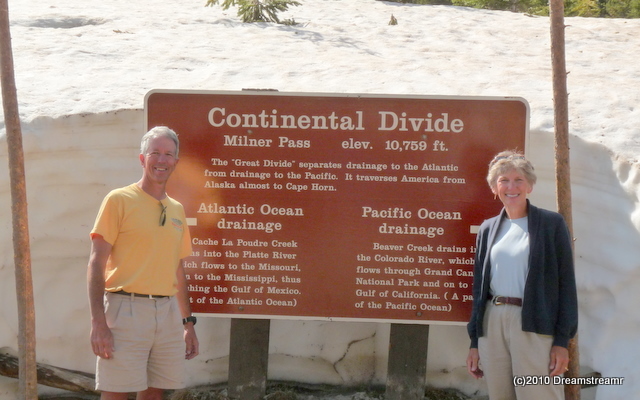 And we hardly thought about this yesterday when we came over the Rocky Mountains, through Rocky Mountain National Park, to Estes Park, Colorado. We traveled a couple of miles and started seeing some wildlife observers parked roadside, peering intently through their binoculars and scopes. It was after 9:30 a.m. but at this altitude the outdoor temperature was still under 60F, so the elk were enjoying their breakfast in the meadows just below the road. We’ve watched elk grazing at dusk in Cataloochee in the Smoky Mountains National Park. 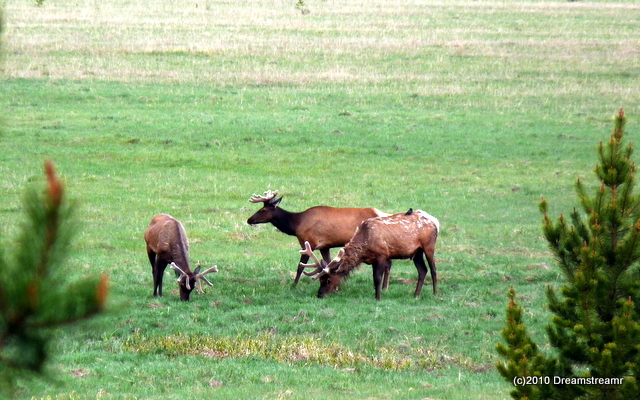 They weren’t nearly so close to our watching station as these Colorado elk are. The road destruction started up again soon after we left the elk. We were last in a queue held by a flagman. He let us go after a short wait and we followed the procession up four or five switchbacks as we climbed Trail Ridge Road, the highest paved road in the USA. We cleared a switchback and suddenly no one was in front of us but the road was blocked by another flagman and heavy equipment in both lanes. The flagman asked us, “Did you lose your pilot car?” We can only guess the flagmen don’t use very good radios, or aren’t using theirs well enough. Could have been touchy if they had released the downhill traffic to head into us. Onward after a short delay and we finally make it to the peak. 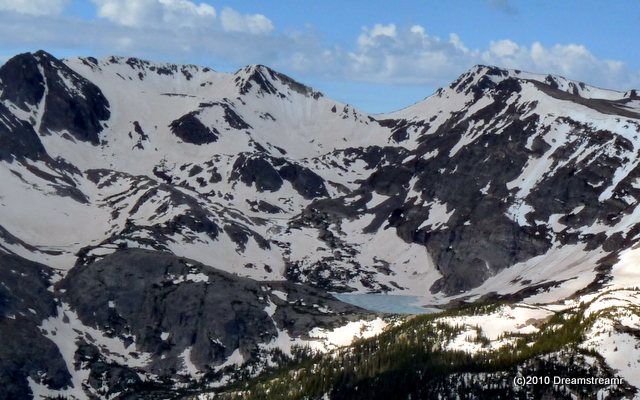 Great views, lots of snow on the ground still, and unfortunately we were one half hour early for the peak Visitor Center. Lots more road construction for a few miles and we finally made it to the Beaver Meadows Visitor Center. 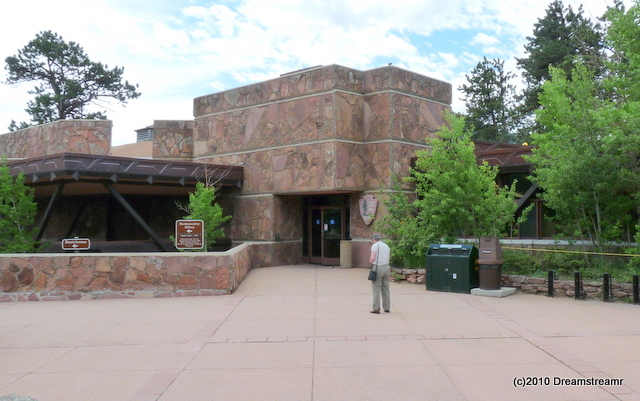 This visitor center on the eastern slope and near Estes Park is designed by Taliesin Associates, the architectural group founded by Frank Lloyd Wright. The building has the long and low roofline of Wright’s designs, as well as use of lots of glass and local stone. The stone was quarried in the 1800s in an old federal quarry nearby. Lichen and a natural aging provided just the look the designers wanted when the building process started in the mid-1960s. 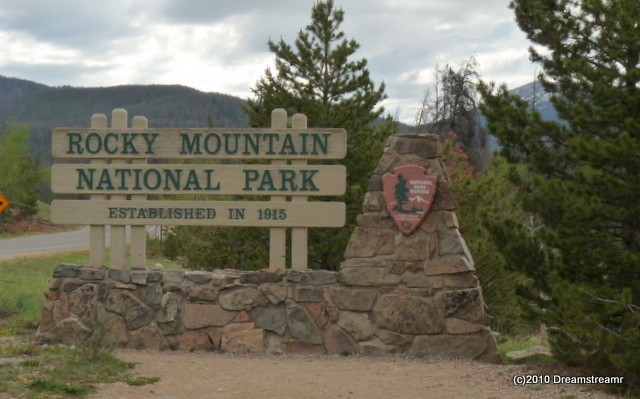 We enjoyed seeing this notable design, functional and really attractive, on our way out of the RMNP. We cruised through Estes Park slowly. Jim tried to imagine the small town he visited last in 1976 as he hitchhiked across the US on his way to San Diego. The small town grew up a lot in thirty-four years, the watering hole he had enjoyed and the motel he suffered were not apparent yesterday. So it goes with sweet memories — best keep them in your head — memories stay fresher than the real thing sometimes. Our truck has towed the trailer and carried us in comfort for over 5,000 miles since we left North Carolina early April. We found a Discount Tire to rotate our tires in Loveland, filled up with gas and had a great time visiting King Soopers grocery (a relative of Kroger). Thinking we had taken care of all our business before we head into wild Wyoming, we retired to our nice campground at Boyd Lake State Park in Loveland. But this morning we found we missed something. Or rather, caught something. Upon starting our journey northward this morning, our tire pressure monitor started alarming immediately. The trailer’s left rear tire was low by over ten psi. We pulled into the next parking lot on our way out of the campground, filled the trailer’s tires all to 65 psi with our portable compressor. Our tire pressure monitor showed the same tire losing one psi per hour on our drive up to Glendow State Park, a little north of Cheyenne, WY. We jacked up the trailer to remove the leaky tire. Our inspection of the tread showed no nails or screws or obvious leaks. Debbie mixed up a cupful of dish detergent and water, and slowly poured it over the tire while Jim rolled the tire on the ground. We were watching intently for any sign of a leak. Suddenly we had lots of soap bubbles showing the leak location. The puncture was caused by a piece of wire like used for tying rebar. We used our handy-dandy plugging tool to repair it, moved the spare tire to the trailer’s right rear, refilled the repaired tire, and put it away as a temporary spare. The plug, unfortunately, is too near the tread edge to be reliable. It may work okay as a low-speed spare if we have a blowout before we arrive in Gillette. We’ll replace this plugged tire while we’re in Gillette. We’ve had really good luck with our trailer over 40,000 miles and truck over 60,000 miles. And we love re-discovering places we visited before, as well as finding new places throughout North America. We’re enjoying this trip tremendously, even with the loss of a tire. No guts, no glory? 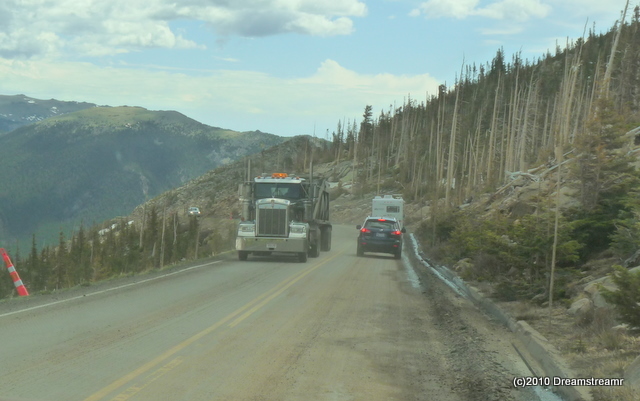 Our truck and trailer showed a lot of guts yesterday, climbing easily over the pass at almost 12,000 feet elevation.